Here’s a playlist of tunes to keep the idea that hope springs eternal into the transition of summer. 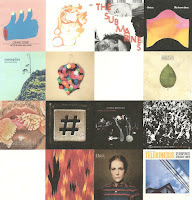 Every week in May seemed to bring another solid release into the music stream and new tunes were ripe for the picking. Link here, enjoy! Chazwick Bundick is the mastermind of Toro y Moi (which loosely translates to “Bull and Me”), creating electronic pop that became an integral part of the chillwave movement. (He is a good buddy of like-minded artist Ernest Greene of Washed Out from days at The University of South Carolina). This bouncy tune “Still Sound,” is off his second release, Underneath the Pine. Bibio is a.k.a. Stephen Wilkinson, a British music producer who studied 'sonic arts' in London. “Anything New” is off his sixth release, Mind Bokeh, as this prolific composer delves into electronic pop and beyond. Michael Benjamin Lerner’s band Telekinesis plays indie rock with a classic pop song structure, catchy hooks and all. This song is off of the Seattle native’s second full release, 12 Desperate Straight Lines. The Boxer Rebellion is an international indie band with American/Tennessee native Nathan Nicolson handling vocals (as well as guitar and keyboards) along with an Australian and two Englishmen in the band. This romp of a song, “Step Out of the Car,” is off their third release The Cold Still. Married couple John Dragonetti and Blake Hazard’s band The Submarines has chronicled their relationship through three releases – these carefully crafted compositions are off of the latest, Love Notes/Letter Bombs. Peter, Bjorn & John are a Swedish indie rock trio which formed in Stockholm in 1999 using their first names for the band name (affectionately abbreviated as PB&J). These three songs show the strength of the latest release, Gimme Some. They wanted to take the high energy of their live shows into the studio and it shows! Bright Eyes is just one of Conor Oberst’s outlet for his busy career (“Shell Games” is off release number ten, The People’s Key). He has said that these new songs move away from folk into a more rock-oriented update, but his signature voice still delivers the same sincerity of performance. Sharon Van Etten is an indie rock folk singer raised in New Jersey who is now based in Brooklyn. “Peace Signs” is off her second release, Epic. She writes deeply personal songs that shine through the strength of her warm, lovely vocals. This L.A. band hit it big with “Sometime Around Midnight” off their first release in 2008. The follow-up, All at Once, displays the same mix of orchestral rock with plenty of attitude. Voxhaul Broadcast is another band from L.A. but they’re just having their break through moment with the release of their long awaited first full release, (appropriately titled) Timing Is Everything. This veteran touring band brings a live sound to their recordings, which are all tightly wound with energy. Named for a fragrant grass from India, this American folk band was founded by Andy Cabic after moving to San Francisco from the East Coast. This sunny tune is a single off the upcoming release, The Errant Charm. Death Cab for Cutie seems to be the personification of the Northwest sound, still on scene since forming in 1997. “You Are a Tourist” is the single off the seventh release, Codes and Keys. Long-time friends Torquil Campbell and Chris Dumont are the duo behind this lush soundscape in “Five Loops.” The song is part of the band’s third full-length release, Here Comes a City. This Danish singer/songwriter just getting noticed in the U.S. comes from a musical family, where she mastered piano at a very young age. Her haunting song “Close Watch” is from her first release from last year, Philharmonics.